Anyone who went to Friday night's Oregon City-Sunset game expecting to see two teams flex some defensive muscle was disappointed. Rahter, those who showed up at Pioneer Memorial Stadium hoping to see a high-scoring shootout to open the OSAA Class 6A football playoffs got their wish. Ethan Kassebaum scored his second touchdown and Oregon City's 11th of the night on a 52-yard run with 1:20 play, delivering the decisive blow in the Pioneers' 75-72 victory over the Apollos in the highest scoring playoff game in Oregon high school 11-man football history. Teron Bradford and Zakayas Dennis-Lee added four touchdowns each to help send the Pioneers (7-3) into next week's round of 16 to face Mt. Hood Conference rival Clackamas, a 53-0 winner over Willamette on Friday. Sunset quarterback Coleman Newsom threw seven touchdown passes -- five to Nick Cizik and two to Joel Bieber -- but the Apollos (5-5) came up short in a game that saw seven lead changes as the two teams combined for over 1,100 yards total offense. "What tipped the game was which team could overcome adversity better," said Kassebaum, who finished with 11 carries for 126 yards. "It's simple. It's like, who has the grit and the perseverance to keep going, and it ended up being us, so I'm proud of my team." Newsom, one of 27 seniors on the Sunset roster, said if anyone had told him before the game that that Apollos would put up 72 points and lose, he never would have believed it. "Just an unbelievable game," Newsom said. "I didn't really know what to expect going in, but I certainly didn't expect that. I think I speak for everyone that we're a little bit crushed, just having a loss like that, season over, and careers over. "It hurts, but it was a great game to be a part of and it was definitely a very special game." The 147 points were the most scored in an Oregon high school 11-man playoff game since 2014 when Lakeridge defeated Westview 79-67 in a first-round game. It also matched the record for the highest scoring 11-man game in Oregon history, first set in Aloha's 84-63 win over Lakerdige in 2012. "I don't know that I've ever seen a game like that," Pioneers coach Dustin Janz said. "I knew there was the potential for it to be a high-scoring game with their offense and the great players that they have on that side of the ball, and I know we have some phenomenal players, too, but I had no idea it would be that kind of game. "I think it just came down to the tenacity and the never-say-quit, never-say-die attitude that our kids have developed over the last several weeks. We showed it a little bit against Central Catholic and didn't get it done, and there were times against Clackamas where we showed some spark and we weren't able to get it done. But to come back in this one and finish it was really nice for our kids." One of the key turning points in the game came after Newsom threw an 18-yard touchdown pass to Bieber to give the Apollos a 57-55 lead with 8:34 remaining in the fourth quarter, and then Bradford returned the ensuing kickoff 88 yards for a touchdown to put the Pioneers back on top 61-57. Sunset had refrained from kicking the ball deep on most of their kickoffs up to that point, willing to give up a few yards while keeping the ball away from Bradford. But on this particular kick, the Apollos sent it deeper than any of their other kickoffs, and although the ball was angling toward the left sideline, it wasn't so close to going out of bounds that Bradford couldn't play it. "I was shocked and happy at the same time," Bradford said. "Honestly, I've been waiting the whole year for someone to kick it to me deep. As soon as I saw it in the air, I was like, 'It's my time to shine.'" When it was Sunset's turn to respond, the Apollos answered with a three and out -- their second of the game. "Pretty brutal," Sunset coach Damien Merrick said. "We had been matching Oregon City score for score for the most part, and then they held us three and out and we game the ball right back." Oregon City then went on an eight-play, 60-yard scoring drive that ended with Bradford grabbing a 25-yard touchdown pass from Austin Bonner on a third-and-4 play to make it a two-score game, 68-57, with 3:07 to play. Sunset ran a reverse on the ensuing kickoff with Gabe Leonard handing the ball the Cizik, who carried all the way to the Oregon City 39. Five plays later, Bieber was on the receiving end of Newsom's seventh touchdown pass of the night and the Apollos tacked on a two-point conversion to climb within 68-65 with 1:31 left. The Apollos tried an onside kick, but Oregon City's Hunter Manassero smothered it at the Pioneers' 48. On first down, Kassebaum found running room to the right and broke free down the sideline for the touchdown that made it 75-65. Sunset's Kaden Williams then scored on a 70-yard kickoff return with 1:09 left, but it was too little, too late as the Pioneers recovered another onside kick attempt and killed the clock. "I just don't feel that we tackled real well," Merrick said. "Credit Oregon City. I think we've been a pretty good tackling team this season for the most part, but those guys made us look like we weren't a very good tackling team. 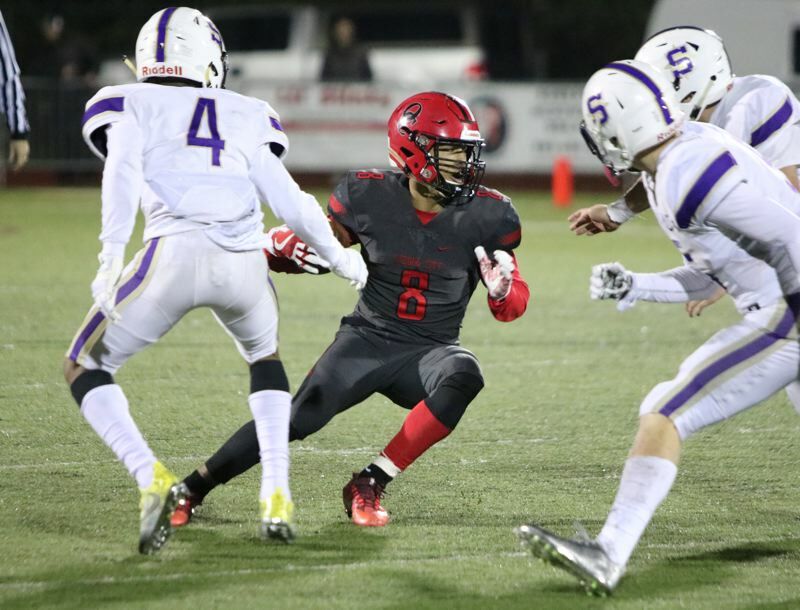 We had guys there at the point of attack often, whether it was on the quarterback or it was on those running backs, and Oregon City made plays. "I figured it was going to be high-scoring. I knew Oregon City had some athletes that were going to be pretty tough to contain. They're going to be a tough out for anybody. I'm sure they probably have Clackamas again, but I'll be shocked if that's not a competitive game. I mean, those guys are explosive." Sunset showed big-play capabilities, too, especially Cizik, the 5-foot-11, 180-pound senior receiver who in the first half caught seven passes for 167 yards with touchdown catches of 32, 25, 37, 24 and 42 yards. Sunset trailed 36-24 in the second quarter when Newsom connected twice with Cizik twice on touchdown passes to give the Apollos a 38-36 lead with 20 seconds left in the second quarter. Oregon City regained the lead on the final play of the first half, scoring on a 68-yard trick play called "Adios" -- a hook-and-lateral pass play that Pioneers assistant coach Jeremy Johnson suggested during a timeout with 12 seconds remaining in the half. On the play, Bonner threw a quick pass to Bradford on the left flat, and then Bradford pitched the ball to Dennis-Lee, who outran the Sunset defense down the left sideline to the end zone to put the Pioneers back on top 42-38 at halftime. "With 12 seconds left, there are only so many calls that you have in your playbook that can go the distance, and that's one that I'm sure Sunset hadn't seen on film," Janz said. "Quite frankly, Teron makes a phenomenal pitch and Zee makes a phenomenal play, because Sunset was in double coverage on Teron, and for him to catch it and pitch with two guys there -- one in front and one behind -- is pretty special. It says a lot about him as a football player and his awareness of the game." Oregon City made one significant change defensively in the second half with Dennis-Lee, the junior strong safety, matched up man-to-man with Cizik, who caught only one pass for 41 yards after halftime. "They put No. 8 (Dennis-Lee) over Nick and, to my discredit, I shied away a bit, just because of the athlete that he is," Newsom said. "I think we still could have got the ball to him. Oregon City didn't do much different defensively, it was just that they played with a different intensity in the second half and we were a little slow getting it started again. "It wasn't anything that Oregon City did to stop us. We just stepped on our own feet here and there and slowed ourselves down." Friday's loss marked the fifth time in eight seasons that Sunset had lost in the first round. "It's an honor just to be able to play in the playoffs," Cizik said. "Unfortunately, we weren't able to make the most of it, but I love my guys. We're the most resilient group I've ever seen, and I think people who haven't noticed before would notice our resiliency in this game. "It's a high-tempo game, lots of points are being scored all over the place -- offense, defense, special teams -- and unfortunately we weren't able to come out of here with a win. But what a great experience, and I'm proud to be an Apollo, that's for sure." Newsom completed 22 of 31 passes for 326 yards, with Cizik making eight catches for 207 yards, and Bieber six catches for 66 yards. Leonard led the Apollos' ground game with 21 carries for 82 yards, and Carter Webb added eight carries for 39 yards. "This is an unbelievable group, character-wise," Merrick said. "They came to work every day and I'm not sure we had a kid absent from practice the whole season out of that senior class, which is pretty rare in today's world. Kids find excuses a lot, but they held each other accountable and they have all four years. "A resilient bunch, for sure. Tonight was kind of a microcosm of our season. We just didn't get it done, but we've battled from behind like that all season long. Sometimes we came out on top, and sometimes we didn't." Oregon City finished with 677 yards total offense to Sunset's 473. Dennis-Lee rushed for a game-high 169 yards on 14 carries, while Kassebaum added another 131 yards on 12 carries, and Bonner had 112 yards on 18 rushes. Bonner completed passes to six different receivers and finished 11 of 18 for 265 yards, with Bradford making six catches for 131 yards. Oregon City advanced to the second the round for the fourth time in five seasons. The question is: Can the Pioneers dial up enough offense to compete with a Clackamas team that beat them 57-27 at Clackamas on Oct. 12? "We're extremely excited about moving on," Janz said. "It's a big step for a first-year coaching staff that was blessed with some really great players and then being able to reward those players by getting them through to the round of 16. "Who knows against the next team? It's high school football, and weird things happen all the time. I think back to when Clackamas lost to Central Catholic in the regular season a couple years ago and then came back and beat Central in the playoffs. That was a turning point that helped lift Clackamas to the semifinals last year and to an undefeated season this year. "I think that's kind of how we're going to sell it this next week is that if we can take of business, this could be the spark that jumps our program to whole other level. And, quite frankly, we've got nothing to lose, so let's go out and give it everything we've got."